Make Your Own “Warming Salve” For Cold Fingers and Toes! This is a salve that can be a real lifesaver in cold Winter weather. Jillee explains how her sister, Rebecca, was shoveling snow and ended up with freezing hands. Rebecca went inside and grabbed a jar of “Naked Salve”, which is a salve with no essential oils in it. She then added a particular, warming essential oil to the salve. She rubbed the combination salve on her hands and they warmed right up and stayed warm! This article contains a link to the recipe for Naked Salve as well as instructions on how to add the warming essential oil. 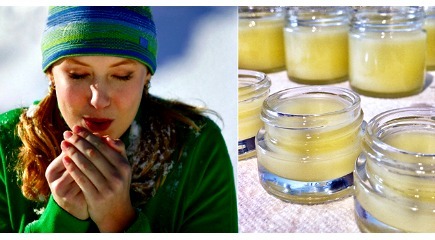 Click on the Make Your Own “Warming Salve” For Cold Fingers and Toes! link to see the complete recipe.